One of the things small businesses and solopreneurs struggle with is generating more sales on a month-to-month basis. You may have only one product – or a series of products and services – but you’re stuck. You’re not sure what other things you can do. You don’t want to exhaust your list by pitching to them over and over again, and you don’t want to always discount your products either. When looking to boost your sales, one area you can pool all your resources and focus on is your content marketing strategy. Up to 59% of marketers agree that having a strong content marketing strategy can help boost sales. And while most content marketing efforts happen on your website with inbound marketing strategies, one effective source to acquire new business is with guest posting. When you guest post, you are placing your content on someone else’s site – typically for free. In exchange for your free content, you can promote your business, products, services and social media profiles in your author bio (and sometimes in the body of your post as well). By guest posting on other sites in your industry you can position yourself as an authority, generate traffic and build backlinks to your site. For example, Evernote’s CEO Phil Libin has contributed to TechCrunch by sharing what goes on behind the scenes of his digital note-tracking app Evernote. By sharing his experience with promoting Evernote on the Mac app store in his guest post, Libin shows how successful the app is, and introduces it to a new audience. This helped him build his brand, develop a loyal following and bring more awareness to Evernote. The effort you put into guest posting on big authority sites, publications and blogs, means the greater reach you will have – helping you drive sales. [W]e successfully grew UK Linkology into a 5 figure monthly business in about 4-5 months by writing content that was tailored to the customers we wanted to attract, and we published on the sites we knew those potential customers would read (e.g. SearchEngineJournal). As is the nature with large publications, traffic from author bio links are low but convert extremely well providing their is a strong connection between your content and service offering. When considering a guest posting strategy, you have to look at the different types of sites you can guest post on to bring traffic. Where do you guest post? As Adam pointed out, even if your guest post doesn’t bring you tons of traffic, you only need targeted traffic – your ideal buyer – to boost your sales. That said, it’s typically most effective to guest post on large publications’ websites and popular blogs. 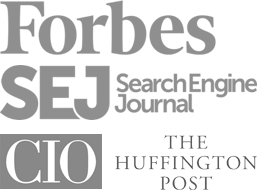 Publication sites normally refer to big authority sites that publish frequently and have a large audience of existing readers. These sites often give the feel of a news or magazine site covering many topics. Examples include Huffington Post and BuzzFeed. The big thing to remember is that when contributing to relevant publications you’ll likely have less people reading your author bio and linking to your site. This is in large part due to the high volume of daily or weekly content being published, less audience engagement, and the many possible distractions like advertising around your author bio. There are numerous blogs in all different types of niches that allow guest posting. And with many of them being high authority and with lots of engagement – SmartBlogger, Scary Mommy, Kissmetrics – you have the potential to drive traffic back to your landing page. When trying to find the ideal blog to guest post on, you want to look for fresh content, a high number of social shares, and a lot of comments (if the site enables comments), since those are strong signals of highly trafficked sites. One final thing to consider when choosing which blog to guest post on is to find a blog that publishes content less frequently. 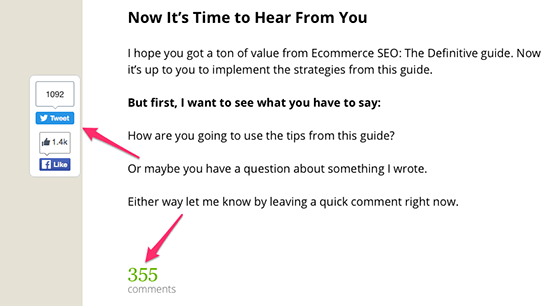 This gives your guest post more time for people to find and read, and it gives it more impact overall. For example, Brian Dean of Backlinko, while he doesn’t have guest contributors, he does post less frequently, but each post consistently performs well. From these two options, you may consider only guest posting on publication sites, but to have a strong content marketing strategy, it’s best to guest post on both platforms since they each can drive traffic and sales. Let’s look at four specific ways guest posting can help boost sales. Guest posting can help build your authority in your niche, which is what you need when you are selling a product or service. Let’s look at a great example of someone who transcended different niches to end up helping creatives make their freelancing work. Paul Jarvis is nowadays known as the person behind the popular, Creative Class course. Over 2,000 people have taken his course and he’s generating a 6-figure income. But, he didn’t start out that way. 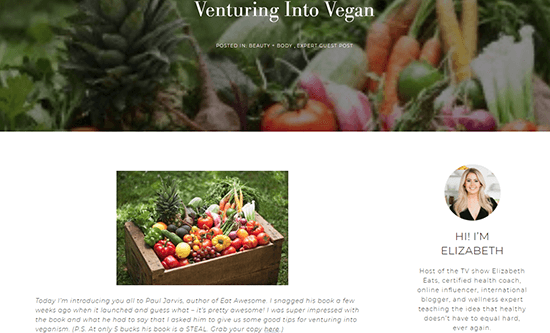 Originally a web designer for many years, before he started in the B2B space he was using guest posting to promote his vegan cookbook, Eat Awesome. He went on to make other books, and became a pro at it. Soon he moved into the freelancing and self-publishing space. He offered his expert knowledge by guest posting on high authority sites. This naturally progressed to helping freelancers grow their business. Crafting a strong guest posting strategy helped him develop into an authority on helping other creatives, which spurred the creation of other books and finally his Creative Class course. Paul strategically chose sites that his target buyers visited, created content that spoke to them, and drove them back to his site or product page. An ongoing issue for any online small business owner, blogger or entrepreneur is traffic. It goes without saying, the more traffic you have, the better chance at monetizing your blog or boosting your sales. And while you can guest post on niche sites with not a lot of traffic, to get more out of your content, it’s always a good idea to publish on highly trafficked authority sites. And if you can score an interview, that’s even better! Hayden Miyamoto of NoHatDigital, is an entrepreneur and seemed to have exploded on the internet from one guest interview on Niche Pursuits back in 2012. Up until that time, Hayden was off the radar. He didn’t blog and he didn’t go out of his way to be known. But his success of earning $30k a month from niche sites got the attention of many bloggers and he decided to do a podcast with Spencer Haws of Niche Pursuits. This led to him starting a blog and because of his guest interview, his business flourished. And just recently he became the owner of Spencer’s highly profitable keyword tool, Long Tail Pro. If your guest post showcases your authority in your niche and you contribute to a popular site, your author bio – which contains links to your site, products or landing page – can be seen by thousands. These can prove to be effective backlinks to help drive traffic to your site. When drafting your author bio keep the following three things in mind. Your bio is the place to give praise to your accomplishments. If your services has helped thousands of people, mention this; if you’ve been featured on popular sites, state them. Visitors who read your bio and don’t know you can quickly assess your expertise, credentials and vocation. Neil mentions companies he’s helped out and what other sites call him – one of the top 10 online marketers. He even mentions the President! If you have big accomplishments, go ahead and summarize them in your author bio. Just remember, some sites only allow one or two sentences, while other sites give you a bit more legroom to draft your bio. Your author bio should clearly state who you are and what you do. This is especially true for service-based businesses. For example, Sharon Hurley Hall is a freelance writer for CrazyEgg. Her author bio let’s other prospects know what exactly she does for a living. One of the most important aspects of your author bio is your call-to-action or CTA. This is what you want readers to do after reading your guest post. For some guest posters, they link to their website, while others link to a product or eBook. Tor Refsland makes sure that his author bio includes a link to download his free productivity book for entrepreneurs. For marketers and small businesses, the main reason to guest post is to direct more traffic to your products and services. Guest posting is a great way to introduce a new audience to your brand and business. To optimize your chances of generating leads, make sure each guest post you put out becomes a part of your sales funnel. Of course, you can streamline your sales funnel in many different ways, but generally, new readers want to get to know your brand and will often sign up to your list where you can market to them more effectively. There are two ways you can make sure your guest post will help increase your sign up rates. If the blog owner or publication allows it, place a link to a blog post with a content upgrade – in your guest post. If your guest post topic is in line with your content upgrade, you should see a spike in your sign-up rate. One clever way to drastically increase your sign up rate is to create a specific guest post that relates to a lead magnet. 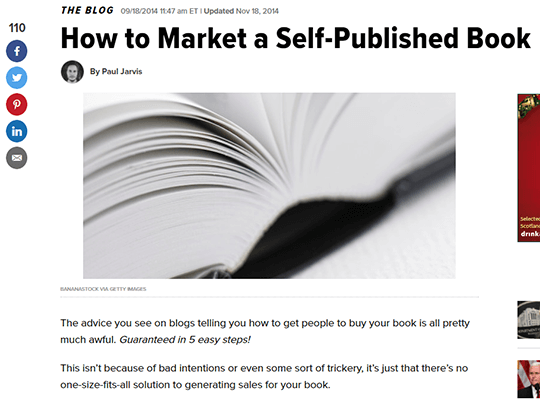 You can then tailor your author bio to include the lead magnet link. For example, Mary Fernandez wrote a post on Smart Blogger about how your WordPress theme is sabotaging your blog. This is a concern for many businesses and bloggers. Her post goes into depth of why using a free WordPress theme could harm your blog. Then, in her author bio, she links to a free guide of her Top 10 WordPress Themes. Undoubtedly, anyone who is using a free WordPress theme and reading Mary’s post is left with wondering which theme to use now. So, when they read her author bio, the chance of them signing up to her list is quite high. When used strategically and optimized for clickthroughs, guest posting can help you boost sales. It’s one of the best ways to bring brand awareness to a new group of people, network with others in your industry, and show off your expert knowledge. Over to you – have you found guest posting to be highly effective in generating new business? Elna Cain is a freelance writer who offers ghostwriting, copywriting and blogging services. She works closely with B2C and B2B businesses providing digital marketing content that gains social media attention and increases your search engine visibility. Check out her new free email course for bloggers and writers, Get Paid to Write Online.